Apple TV sold 1.4 million units during the holiday quarter after sales of just over 2.8 million across its first year as an iOS product, but Apple's executives are still describing it as a hobby. 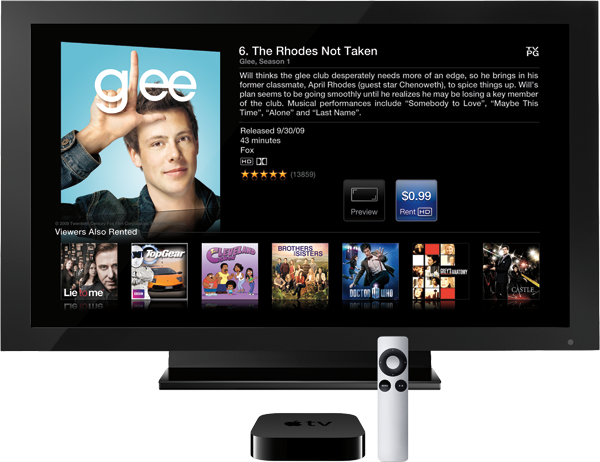 Apple converted its original Apple TV product into a $99 iOS-based device in September 2010. Since then, the company has sold more than 4.2 million of the set top boxes, with nearly a third of those sales occurring in the last quarter. Speaking in the company's quarterly earnings conference call, chief executive Tim Cook responded to a question about Apple's living room strategy involving TV by saying that its existing product, Apple TV, is "actually doing pretty well." After noting the sales figures, Cook said "in the scheme of things, if you dollarize it, we still classify it as a hobby." However, Cook also noted that "we continue to add things to it," alluding to updates over the past year that have added new app-like features. "I couldn't live without it," Cook added. "We continue to pull the strings to see where it takes us." Some analysts, particularly Gene Munster of Piper Jaffray, have long advocated that Apple build an HDTV incorporating the features of Apple TV and other technologies, including Siri voice features of the new iPhone 4S. However, Cook's comments do not appear to suggest that Apple is gearing up to make TV a central part of its plans for 2012, unlike efforts by Google to reanimate its Android-based Google TV product and Microsoft's focus on TV features of the company's Xbox 360 game console, which the company's chief executive Steve Ballmer gave significant mention to in his final keynote at CES. Samsung and other companies have made so called "Smart TVs" central to their marketing strategies. Steve Jobs previously noted that a TV set top box is difficult product to market, as any hardware vendor would have to compete against cable or satellite providers. However, Jobs subsequently was quoted in his Walter Isaacson biography as saying he had "finally cracked" a workable concept for an HDTV interface, with Isaacson writing that Jobs "wanted to do for television sets what he had done for computers, music players, and phones: make them simple and elegant." Jobs didn't specifically mention plans to sell Apple-branded TVs, however. Large HDTVs would seem to be a poor fit for Apple's relatively small retail stores, where most of the company's products are relatively small, light and take up relatively little inventory space. At the same time, Apple has introduced AirPlay and AirPlay mirroring as key features of iPad 2 and iPhone 4S last year, indicating that it sees significant potential in Apple TV, at least as a standalone product. In December, NPD reported Apple TV taking 32 percent of the "connected TV player" market.